In our recent taste tests, these were definitely the winners! I think these won because they tasted the most like traditional Rice Krispie Treats, but they were cranked up a notch, a big notch. The browned butter and the sea salt makes such a DIVINE difference. You’ll know when you taste them. Look at all that was left to photograph! My older daughter wants me to throw out the original recipe for Rice Krispie Treats and just use this one from now on. I didn’t want to up this recipe to use a 9 x 13 pan, because there is quite a bit of butter in this recipe–and it has to be browned, which can be a tricky step. I’d suggest making two batches, rather than one larger batch, if you are trying to feed a crowd. I did put my batch in a 7×11 pan, rather than the specified 8×8 pan. I found this recipe at Smitten Kitchen. Butter (or coat with non-stick spray) an 8-inch square cake pan. In a large pot, melt butter over medium-low heat. It will melt, then foam, then turn clear golden and finally start to turn brown and smell nutty. Stir frequently, scraping up any bits from the bottom as you do. Don’t take your eyes off the pot, the period between the time the butter begins to take on color and the point where it burns is often less than a minute. As soon as the butter takes on a nutty color, turn the heat off and stir in the marshmallows. The residual heat from the melted butter should be enough to melt them, but if it is not, turn it back on low until the marshmallows are smooth. Remove the pot from the stove and stir in the salt and cereal together. Quickly spread into prepared pan, pressing firmly and evenly into the edges and corners (butter a spatula or use the paper from the butter for this job). Let cool and then cut into squares. I looooove coconut so I HAD to make these. Had to. I am glad I did, too. This recipe is a keeper! I have coconut loving friends that are going to want to me to make these. I’ll offer to bring them to their parties. I’ll get a lot of invitations to of parties! Maybe not grown-up cocktail parties (LOL), but that’s OK. Down home, multi-generational, potluck parties are more my style anyway. I found this recipe at the Craving Chronicles but had to change it up a bit. I wish I had increased the recipe to fit into a 9×13 inch pan, but I wasn’t smart enough. You can though, just increase all the ingredients by 50% (don’t throw out the extra ounce of marshmallows, throw the whole pound bag in there). One more thing, I’ve made these several times now. I don’t think I will put a chocolate drizzle on the top again. The coconut goodness does it for me. I don’t need the chocolate. It kind of gets in the way. But you do what suits your palate best :). One MORE thing, in the photo, I put the chocolate on top of the coconut. Ooops. If you do use chocolate, don’t do this. The chocolate and coconut fall off. Chocolate first, THEN coconut, K? * To toast coconut, spread shredded coconut in an even layer on a cookie sheet and bake at 300F, stirring every few minutes, for 10-15 minutes or until coconut is golden brown. Don’t walk away from the oven! The coconut will brown very quickly, so keep an eye on it. Set aside to cool. Prepare an 8 or 9 inch square dish by either buttering or spraying with cooking spray. In a large saucepan, melt butter. Add marshmallows and heat over medium-low heat, stirring until melted. Stir in shredded coconut and coconut extract. Remove from heat. Add Rice Krispies and stir until thoroughly coated. Spread Rice Krispie mixture into prepared pan. With the back of a buttered spatula or using a sheet of waxed paper, press mixture firmly into an even layer. If desired melt chocolate chips and drizzle over the tops of the treats. Spread slightly, if desired. Sprinkle toasted coconut and press lightly to adhere to the chocolate and the top of the treats. Cool at room temperature until chocolate hardens. Once cool, cut into squares and enjoy! Thanks for stopping by my kitchen today…, and don’t forget to send me that invitation to the party! For years I had forgotten about Rice Krispie Treats (thinking of them as kid stuff) then a neighbor brought a batch to a block party. I went wild. Rice Krispie treats are officially one of my danger foods now. Don’t leave me in a room with a pan of them. Ever. Over the past few years I have amassed quite a collection of Rice Krispie Treat recipes, each one better than the last. First it was Peanut Butter Rice Krispie Treats, then Toasted Coconut Rice Krispie Treats, then Salted Brown Butter Rice Krispie Treats and now, my current favorite, Chocolate-Chocolate Cherry Rice Krispie Treats. 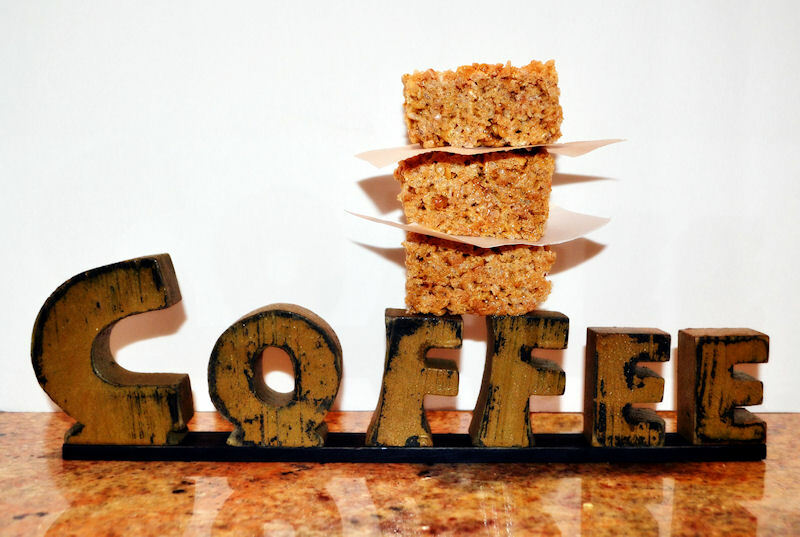 I HAVE tried some recipes that bombed, too…, the Butterscotch Rice Krispie Treats, a Chocolate Rice Krispie Treat and a Coffee Rice Krispie Treat. In spite of the name, there is not much chocolate in these treats. There’s white chocolate mixed in with the marshmallows, and some semi sweet chocolate drizzled on top, but that’s all. The chocolates work very well with the exciting flavor of the dried cherries. The original recipe for these Rice Krispie Treats was from a 2009 Cooks Country magazine, but it only made enough for an 8″ x 8″ pan. Where’s the fun in that? I upped the quantities to use an entire 1 lb bag of miniature marshmallows so the mixture would fit into the traditional Rice Krispie Treat pan, the faithful 9″ x 13″ glass pan. Prepare a 9 x 13 inch pan be buttering, spraying with Pam or lining with foil, whichever method you are most comfortable with (I spray with Pam). Melt butter in a large pot over low heat. Add marshmallows, white chocolate chips, and salt. Cook, stirring constantly, until entire mixture is melted and smooth, about 8 minutes. Stir in vanilla. Remove from heat. Off heat, stir in Rice Krispies and cherries. Make sure all the cereal is evenly coated with the marshmallow mixture. This will take some stirring. When mixture is fully combined and there are no dry pockets of cereal, pour into prepared pan. With greased paper (I use the paper off the butter) or a greased spatula, press on the mixture to even out the top and to eliminate all air pockets. Melt semisweet chocolate chips in the microwave on low at 30 second intervals until smooth. Pour melted chocolate into a Ziploc bag (preferably a freezer strength Ziploc), move the chocolate into one corner of the bag. Using scissors, clip a tiny piece off the corner and drizzle chocolate over the Rice Krispie Treats in the pan. Allow chocolate to cool and harden (if you are in a hurry, put the treats in the refrigerator) before cutting treats into serving pieces and serving. Thanks for stopping by my kitchen today. I’ll be busy transferring the other Rice Krispie Treat recipes from my “Polly, Julie, and Julia” Facebook page soon! You know I am crying my eyes out about our canceled family and friends camping trip, right? My daughter, Abby, thought these might cheer me up. They did! The are ooey-gooey-sticky-messy-yummy, just like the real thing–and she used the extra thick chocolate option, so they were extra chocolatey, too. Preheat the oven to 350 degrees. Grease an 8-inch square baking pan. Use an electric mixer to cream together butter and sugar until light and fluffy. Beat in egg and vanilla. Set aside. Meanwhile,whisk together flour, graham cracker crumbs, baking powder and salt. Slowly add flour mixture to the creamed butter mixture until combined. Divide dough in half and press half of dough into an even layer on the bottom of the prepared pan.Place chocolate bars over dough–2 king-sized Hershey’s bars should fit perfectly side by side. Spread chocolate with marshmallow creme or fluff. Place remaining dough in a single layer on top of the fluff (most easily achieved by flattening the dough into small shingles and laying them together). Bake for 30 to 35 minutes, until lightly browned. Be sure to cool completely before cutting into bars. Makes 16 squares. Cool completely before cutting into bars. I have been looking for a recipe for S’mores Bars since they started showing up in bakery cases a few years ago. I guess the idea of moving S’mores from the campfire to a bar started with the boxed granola bar. The mass product manufacturers didn’t get it right though. Eating a boxed S’more granola bar is like eating textured, scented cardboard. S’mores Bars in bakery cases don’t fare too well either. The usual recipe seems to be overly sweet chocolate brownies with marshmallows and graham cracker crumbs on the top. But I have the right recipe now! The bottom is 2 parts graham crackers to one part chocolate. Perfect ratio, right? The graham crackers and chocolate are held together with sweetened goodness and there are sticky, gooey, melted marshmallows on top. The right flavor. The right texture. The right stickiness. I wasn’t a girl scout for 17 years for nothing! The inspiration for this recipe came from the Taste of Home “Cookies: 623 Irresistible Delights!“. Page 217 has a Graham Cracker Brownie recipe attributed to Cathy Guffey from PA. I just added the marshmallows and gave the bars a more appropriate name. I am thinking I need to double this recipe next time and make it in an 13 x 11 inch pan. Preheat oven to 350 degrees. Butter an 8×8 inch baking pan. Crush the graham crackers by whacking them in the package. I use a meat mallet, but the back of a soup ladle, measuring cup, or small pan will also work–don’t make really fine crumbs, though. Leave some big pieces. Put the (large)crumbs in a mixing bowl, add the chocolate chips, baking powder and salt and combine. Stir in the sweetened condensed milk. Spread mixture into an 8×8 inch baking pan. Bake in preheated 350 degree oven for 30 minutes. Take out of oven and sprinkle miniature marshmallows over the top. Return pan to oven for 4-5 minutes to melt marshmallows. Remove pan from oven and quickly spread melting marshmallows smoothly over the top with an offset spatula. Let bars cool completely. Now comes the hard part, cutting the bars. I find it a bit easier to use a warmed knife for each cut…but it is still a sticky job, which makes them true S’mores Bars!. Cut into 16 bars. How many girl scouts, former and current, stopped by my kitchen today? Do you think you’ll try these?